If I can just paraphrase the Second Doctor there, as that is pretty much the thought that was running through my mind from the moment the Tenth Doctor stepped before the press in 2005. I’ve always been a coat person, more specifically, I’ve always been a long coat person, but in the past this predilection has been confined to mere mid-length coats; long but not long. Not until I saw Tennant’s trench coat did I realize that THAT was the coat I had been looking for. And you just can’t find it anywhere – it’s unique. 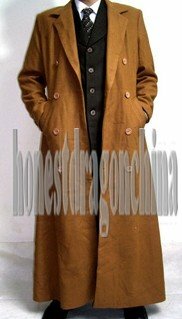 To cut a long story short, I, like Mr. Steven Ricks, was searching eBay and came across the Honest Dragon ‘Tennant Coat’. Could this be the answer to my search for the perfect coat? Read Steve’s blog for the reasons why, but suffice to say, it’s really not a workaday coat or a good replica. It really was an excruciating wait, not because of any problems with the coat-making process, but simply because I knew what was coming was going to be it and I just had to have the coat there and then. Throughout the whole process, Steve was never less than professional, but in addition to that he was always willing to answer any questions I had (which were many!) and provided constant progress reports and any unexpected delays that were met along the way. I felt confident that my money was well spent. Onto the coat itself; it arrived, nicely packaged and it was a marvelous moment when it unfolded – such lovely fabric, beautifully heavy and very very LONG! Oh and yes, it fit perfectly, my coat. Many others have commented much more lucidly than I ever could regarding the coat’s many qualities, but I’d like to point out its overwhelming accuracy to the screen coat: pockets, lapels, vent, buttons, stitching etc. I was simply speechless with admiration and do you know what – I really didn’t think once about the price I’d paid; that’s how good the finished coat was. It hangs perfectly, billows magnificently in the breeze and the pockets really are bigger on the inside – everything you need for your day will be contained within! Steve, you are a craftsman! he asked, wide-eyed and admiringly at my attire. So there we go, can I just say a big thank you again for great service and friendly communication - oh and the coat itself of course! Hope to maybe buy from you again in the future! I looking at getting coat and I still shopping about .. I know ebay can be risky but i looking at ones do by musicdress and dream-cosplay but not sure after reading you post as to what you got from HD. The one thing I did note these people make cheap cosplay costumes so questing those who have bought is something i been doing.. so far people seem to be very happy with their coat from dream-cosplay but musicdress sales are not listing who has gotten a DW coat. The photos on the web sites seem very much like they could be pulled. I like the work you are doing wish i could afford some of the bestter work I seen here it is out standing.